Along with their cohorts in the care and service sectors, nurses are helping redefine the face — and fight — of organized labor. Five thousand nurses throughout California, represented by National Nurses United and the California Nurses Association, are holding a mix of one and two-day strikes over the next two days. 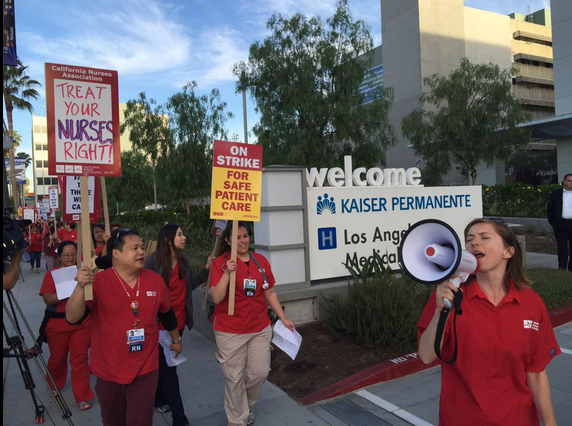 Picketing for 1,100 nurses and their supporters began at 7 a.m. on Thursday at Kaiser Permanente’s Los Angeles Medical Center, and will start early Friday at Providence Little Company of Mary Medical Center in Torrance, Providence Saint John’s Health Center in Santa Monica and other hospitals. Workers, many of them employed by some of the state’s largest non-profit health care companies, are calling for wage increases, a traditional demand for union contract fights, along with improved staffing policies to improve patient safety. Similar to fast food workers’ Fight for 15 campaign, strikers have also taken aim at the hearty incomes of non-profit health care corporation CEOs. A report released back in January by the Sacramento Bee found that Sutter’s Patrick Fry is the city’s highest-paid non-profit CEO, bringing home $3,862,787 last year. Over 1,500 NNU-represented nurses in Chicago called off their strike after reaching a tentative agreement late Monday night with the University of Chicago Medical Center, where registered nurses have been working without a contract since October. They will vote whether or not to ratify the proposed contract early next week on May 5. The nurses’ strike action comes as care work — a broad category including registered nurses, housekeepers, nursing home staff and more — becomes an increasingly militant and innovative edge of the labor movement, with NNU in particular lending its support to causes traditionally considered outside organized labor’s purview. The union, for instance, was a major supporter of the People’s Climate March in September, and turned out on picket lines for the United Steelworkers’ historic nationwide refinery strike last month. While nursing has long been a unionized profession, domestic workers — a majority of whom are women — have long been excluded from basic New Deal labor protections, in no small part because many are undocumented women of color. Through actions like this week’s strikes and that by fast food employees earlier this month, nurses, housekeepers and traditionally marginalized workers in the service sector may well be redefining the face — and fight — of organized labor.